You have questions, and we have answers! Click on any of the frequently asked questions below to learn more. Powder Coating is a dry finishing process that is used on a variety of metal products. A dry mix of resins, pigments and fillers melt and fuse together into a solid coating while curing in a high temperature oven. Powder Coating offers a superior finish while adding properties such as resistance to corrosion, chemicals, heat, impact, abrasion, UV rays and other extreme weather conditions. Although Powder Coating is tough and impact-resistant, it is still able to easily withstand flexing action (i.e. springs). What are some known facts about Powder Coating? Powder is tough, attractive, durable, scratch-resistant, versatile, long-lasting and available in almost any color. How does powder adhere to a surface? The application process involves applying a charge to the dry powder particles and sprying them onto a grounded substrate (part). The substrate is grounded so the powder will then be attracted to the surface. Any color is available in Powder Coating for all interior and exterior applications. Once you know what color you want, our powder coating personnel will assist you in matching the perfect color. We offer a variety of colors in stock for quick turnaround time. What type of materials can be coated? All objects made from metal can be powder coated including: steel, aluminum, brass, copper, bronze, titanium, magnesium, aluminum, castings, etc. What are some items that can be Powder Coated? Some common items that can be Powder Coated include patio and indoor furniture, auto/plane/boat parts, plumbing and light fixtures, AC units, fencing, sculptures, hand rails, statues, lamp posts and much more! Virtually anything metal can be Powder Coated. Why is Powder Coating better than liquid paint? Powder Coating is far superior to liquid paint due to having a thicker coat, which is more resistant to chipping, scratching and fading. Powder Coating has the ability to be applied to more objects, as opposed to liquid paint. What powder is best-suited for outdoors and combatting harsh weather? Does Powder Coating drip, run or sag? Because of the way powder is applied to the substrate (part) using electrolysis, the powder goes on uniformly. The powder is then heated in an oven to let the powder flow and crosslink to a hard and long-lasting finish. The end product is drip, run and sag-free. Can you Powder Coat over existing finish? 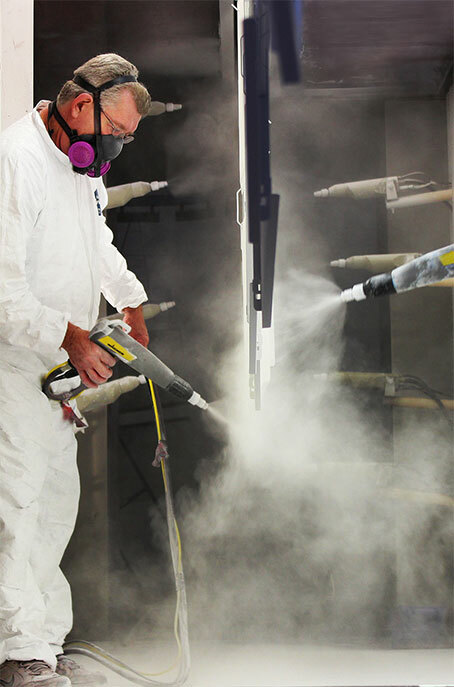 No, because one of the steps in powder coating requires the substrate (part) to be cleaned, usually by media blasting, removing all existing finishes. Can coil springs be Powder Coated? Yes-- Powder Coatings are very flexible, and can flex with the metal as the spring coils and recoils to its stationary position. Also epoxy, acrylic and hybrid powders provide excellent adhesion and hardness for improved resistance to chipping, abrasion, corrosion and chemicals. It is also flexible enough to be formable without cracking. The process is relatively simple. A finely ground powder is applied to a part using a powder gun that charges the powder being applied so that the powder electrostatically adheres to the grounded part. The part is then placed in the curing oven where the powder melts and cures, becoming cross-linked to the part producing a continuous hard coating. Can parts be coated with clear Powder Coating? Clear Powder Coat will keep newly polished aluminum rims looking like the day they were polished. Clear Powder Coat is also good to protect plumbing and inside, outside lighting fixtures. Can powder colors be matched? Powders come in high and low gloss, metallic, textured and clear finishes. Powder textures range from smooth to wrinkled and even matte. Rough powder textures are designed to hide imperfections. How do I go about choosing a color? A&A Powder Coating has hundreds of color chips to choose from and also has access to thousands more. We will assist you in the selection of the color that is best-suited for you. Can polished parts be coated in clear? Clear Powder Coat is available in semi gloss and high gloss. Polished parts coated with clear eliminate the need to continuously repolish your parts. What is the most cost-effective way to powder coat? The most cost-effective way to Powder Coat is to have a number of pieces done at one time. This will cut down additional setup time and will save you money. Is Powder Coating environmentally friendly or green? Powder has no VOC's and is HAPs free.